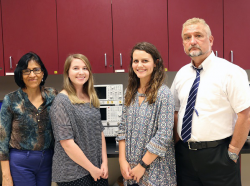 Pictured (l-r): Rocio Alba-Flores, Ph.D., associate professor of electrical engineering; Molly Hopper, MAT candidate; Lindsey Snowden, MAT candidate; and Valentin Soloiu; Ph.D., professor of mechanical engineering. Master of Arts in Teaching (M.A.T.) candidates Molly Hopper and Lindsay Snowden from Georgia Southern University’s College of Education have been selected to participate in a seven-week advanced research experience for teachers at the University sponsored by the National Science Foundation. This experience will involve conducting solar water heater research under the direction of Valentin Soloiu, Ph.D. along with faculty member David Calamas, Ph.D. Georgia Southern faculty involved in the project state that having secondary teachers research with them in the labs allows these teachers to better prepare the next generation of engineering students and make students more aware of the real world applications of engineering and technology. Hopper and Snowden are two of 10 Georgia teachers selected for this summer experience. Snowden also expressed her excitement in being a part of the program. Both Hopper and Snowden conveyed the value this program can bring to their instruction in the classroom. Hopper and Snowden are completing the M.A.T. Secondary Education program in the area of biology. They both also hold undergraduate degrees in biology from the University. ENERGY program founders Soloiu, professor of mechanical engineering and Allen E. Paulson Distinguished Chair of Renewable Energy (PI), and Rocio Alba-Flores, associate professor of electrical engineering (co-PI), were awarded a three-year grant by the National Science Foundation (NSF) for their project entitled “ENgaging Educators in Renewable enerGY (ENERGY).” The NSF grant is part of the Research Experiences for Teachers (RET) program. The Allen E. Paulson College of Engineering and Information Technology is dedicated to increasing the level of STEM education throughout Georgia with projects like ENERGY. The grant program will be offered for the next three years.